On Tuesday, August 21, 2018, students in the Catoctin feeder district went “shopping” for free school supplies, thanks to generous donations from local churches, organizations, and the Stuff the Bus school supply drive. A total of 206 students, along with their families, gathered at Graceham Moravian Church in Thurmont for the annual Catoctin Community School Supply Program. 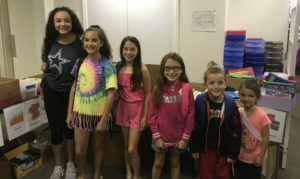 After selecting a brand new backpack, students went to the “store,” where they found hundreds of supplies, including folders and notebooks in nine different colors, stacks of binders and notebook paper, crayons, pens, pencils, rulers and more. Also, every student received a pair of headphones; middle and high school students were given USB drives. Jen and Laura Harbaugh have been coordinating this event for ten years. They were joined this year by volunteers from Graceham Moravian Church, Harriet Chapel, CASS, and students in the Lewistown 4-H Club.